Srila Prabhupada went everywhere to spread Krsna Consciousness. He was not afraid to sit down on the ground or the hot pavement in New York City or San Francisco or anywhere. He was fearless in his preaching for Krsna. He met Allen Ginsberg, John Lennon, George Harrison, among many others, and turned on an entire generation to the chanting of Hare Krsna during the sixties and early seventies. He fed them delicious spiritual foodstuffs offered to Krsna in love, called prasadam, or the Lord's mercy. The above poster was created to help promote a dynamic and now legendary spiritual event in San Francisco, 1967. All proceeds went to help establish Srila Prabhupada's San Francisco Hare Krsna Temple. 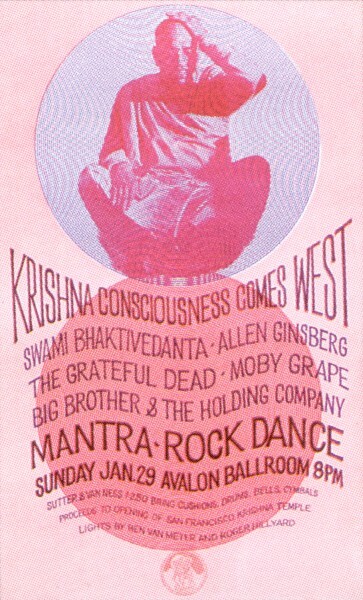 Ginsberg later recalled, "We sang Hare Krsna all evening. It was absolutely great -- an open thing. It was the height of the Haight-Ashbury spiritual enthusiasm."